Tomorrow, Tuesday, 19/03/2019, the bill of the Ministry of Interior “Promoting substantial gender equality, preventing and combating gender-based violence – Regulations for the granting of Citizenship – Provisions for the Local Government elections – Other provisions of the Ministry of the Interior” is being voted. The bill ushers in new regulations for the granting of Greek citizenship under the process of naturalization. 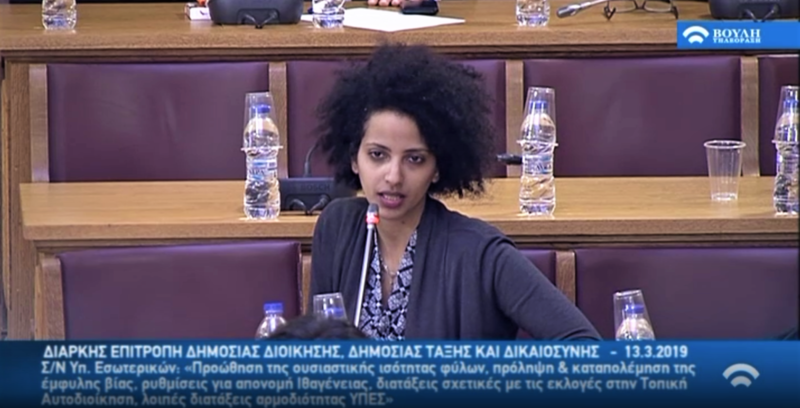 On Wednesday 13/03/2019, Sebene Eshete Advocacy Coordinator of Generation 2.0 for Rights, Equality & Diversity was invited to speak at the Parliamentary Session of the Standing Committee on Public Administration, Public Order and Justice, where she presented our views regarding these new regulations on citizenship. Read here our written comments and suggestions to the committee. We acknowledged the positive changes and noted the provisions which we found to be problematic. In particular, Article 32 which foresees the replacement of the naturalization interview by a standardized test, and Article 35 which adds the condition of continuous permanent residence in Greece from the day of the application and thereafter. We hope these suggestions will be considered and the necessary changes made in the final bill to be voted on tomorrow. “The provisions for certain vulnerable groups of the population, i.e. people with disabilities, as well as for citizens over 65, and the reduction of the fee from 700 to 550 euros, are positive changes as they make the process more accessible to the citizens concerned. However, some articles of the bill in a very short time from today essentially add new terms (standard and substantive) for all applicants. Considering that the provisions proposed appear to only contribute to the exclusion of integrated citizens and shift the burden relating to the delays in the processing of applications to the applicants themselves, we recommend the following amendments. Regarding the standard conditions, Article 32 includes provisions that will come into effect from 30-4-2019 and therefore will also apply to pending naturalization applications. The provisions refer to the replacement of the current interview procedure to a more standardized one (in the form of a test) as an exclusive way of assessing the level of an applicant’s integration. Although the ministerial decision regulating the requirements of this specific test has not been made public, an informative note from the Ministry of the Interior describes that this examination will exclusively be in the form of 30 questions selected at random. What is more, a specific language examination requirement has been added without there being any Greek language state programs in operation across the country for migrant populations. Without questioning the necessity of knowledge of the Greek language, a separate examination may exclude citizens who, although have sufficient oral language skills, have not yet acquired the necessary knowledge to pass a written examination. Taking into account the conclusions of the Special Secretariat for Citizenship regarding the to date highly inconsistent nature of the interviews, and given that the integration of a person in the Greek society cannot be assessed through such a narrow process, we propose to avoid the exclusive use of these questions and instead their use either as an alternative means of assessing the substantive requirements for applicants who wish to do so, or as a supplement to a shorter interview. In addition, Article 35 now adds a condition of permanent continuous residence in Greece from the date of the application and thereafter. If an applicant is abroad for any reason (e.g. studies or work) for up to 18 months, their naturalization application will be suspended. In practice, what this means is that if a third-country national holds a long-term residence permit, they will not be able to utilize their European-funded right to travel and work within the EU until the Directorate has examined their application. At the same time, the possibility of some third country nationals as well as of EU citizens, to be out of the country in accordance with the periods allowed by their respective residence permit based on the provisions of Immigration and Social Integration Code (Law 4251/14), is being ignored. It is well known to the Ministry that the deadlines set for assessing naturalization applications as defined in Article 31 of the Greek Citizenship Code are not being upheld and that the interviews are being held up to 5 years after the submission of the application. Based on the above, this additional requirement – in its current wording – appears to result in passing the burden of the delays in assessing applications to the applicants themselves. For these reasons, we propose the addition of a regulation whereby the applications of applicants absent from the country based on the foreseen allowed periods of absence, as provided for by law, are not suspended. Watch the entire speech on YouTube and Facebook.